RANDOM HAPPENINGS AND MEALS ON DENMAN ISLAND; FAVORITE LOWFAT "BUTTER"
Snap peas from our garden, stir-fried with Soy Curls (see here for info). 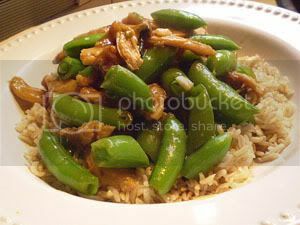 The recipe, which I made for a casual lunch for our guests one day, is adapted from the Tofu with Snow Peas recipe in my book "Authentic Chinese Cuisine for the Contemporary Kitchen ". Strawberry Crepes or Blintzes. 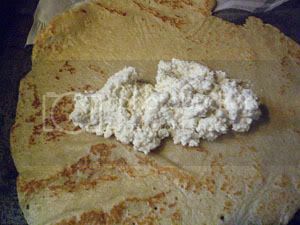 Blintzes are crepes (my vegan Tofu Crepes from my book "Soyfoods Cooking for a Positive Menopause ", in this case) filled with cottage cheese and are supposed to be folded into bundles and browned in a bit of butter, but I usually bake them instead. I make my own Tofu Cottage Cheese . 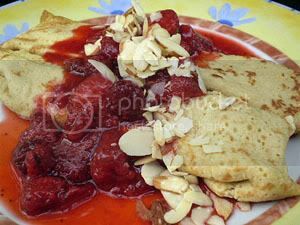 For fancier filled crepes (like the bottom photo), I use my Tofu Cashew Ricotta from my book "Nonna's Italian Kitchen ". 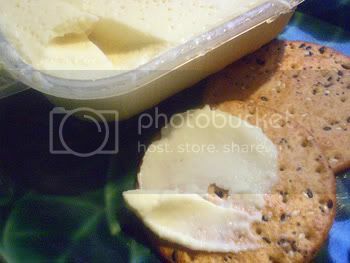 You could also use a commercial tofu "cream cheese", such as Tofutti or Sheese brands (or my new Okara/Cashew Ricotta). My low-fat "Corn Butter". 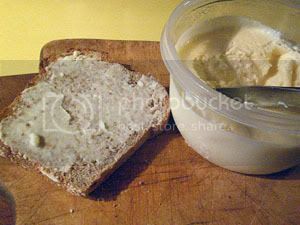 After the excesses of this last week, I'm trying to stay on Weight Watcher's Core Plan as much as possible, so I made some of my "Corn Butter", so I don't have to feel guilty when I "butter" a piece of DH's fresh-baked wholewheat bread! I have fooled around with low-fat "fake butters" for years. This is my current favorite (Update, 2012: it still is!) -- tastes very good, melts and only 13.5 calories per tablespoon! NOTE: Don't try to use this for baking or frying, etc., instead of butter or margarine, though-- it's only meant for spreading, topping potatoes, etc. UPDATE, 2011: To make this spread richer, but still fairly low-calorie, add 1/2 cup of your favorite vegan "buttery spread" (see the recipe for my homemade vegan palm oil-free "Buttah") to the full recipe (or 1/4 cup to the half recipe at the end). 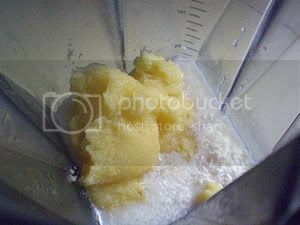 Add it after you have blended it smooth and blend a little more. Then refrigerate as usual. This makes a spread with about 40 calories per tablespoon instead of about 100 for butter or margarine. This spread is easy, inexpensive, and needs no exotic ingredients. It can be soy-free. It melts when spread on hot food and has a clean rich taste. 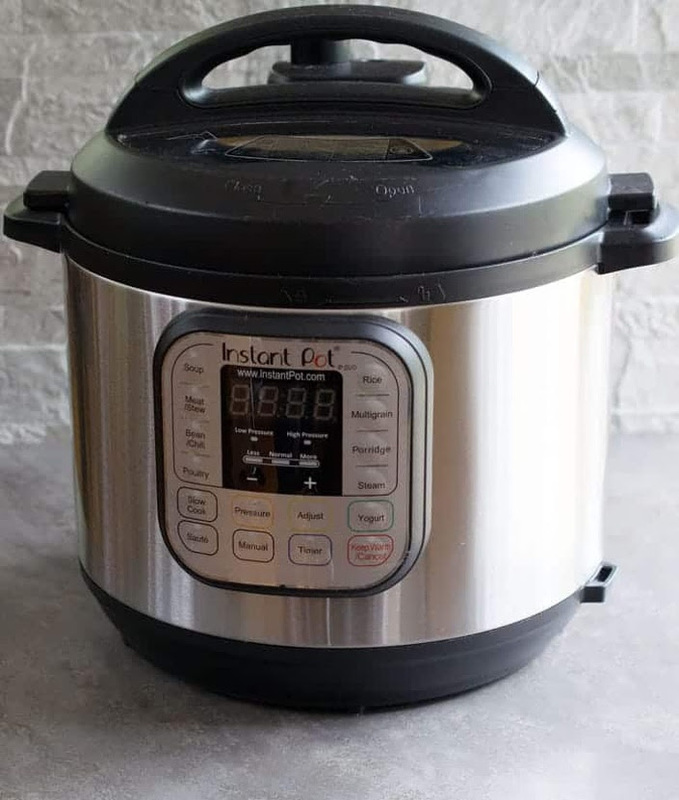 Cook in a double-boiler-type arrangement (with the saucepan inside of another pan of simmering water) for 10 minutes, OR MICROWAVE on high power in the bowl for 1 minute, whisk, microwave 1 minute more, whisk, and microwave 1 minute more. Place this in a blender along with the warm water, coconut, lemon juice, and salt. Blend for several minutes, until as smooth as possible (this is important). Be patient! It may have a bit of graininess from the coconut, but should not have much. Place in a covered container in the refrigerator. It firms up nicely, but remains spreadable. It's good on veggies, too, and you can add garlic and broil it for garlic toast (maybe with a sprinkle of vegan parmesan). Nutrition (per 2 tablespoons): 27.8 calories; 53% calories from fat; 1.7g total fat; 0.0mg cholesterol; 151.9mg sodium; 27.3mg potassium; 2.8g carbohydrates; 0.6g fiber; 0.2g sugar; 2.2g net carbs; 0.6g protein; 0.6 points. This was fragrant and delicious! 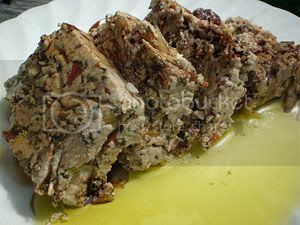 I adapted it from a recipe in "From the Land of Figs and Olives " by Habeeb Salloum and James Peters. 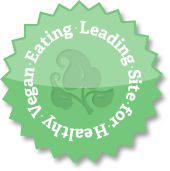 In a large nonstick skillet, sauté the Soy Curls in the vegan butter or olive oil over medium heat until they turn golden brown in spots. Remove from the pan and set aside. Steam-fry the onions in the same pan over high heat until they begin to brown, adding a splash of water as needed to keep from sticking, and stirring often. Add the garlic and cilantro. Stir-fry for another 3 minutes. Stir in the remaining ingredients, including the Soy Curls, and bring to a boil. Turn down the heat, cover and simmer for 30 minutes or until it is stew-like. Taste for salt and pepper. Serve hot over basmati rice or bulgur, or with pita. Nutrition (per serving): 250.9 calories; 34% calories from fat; 9.7g total fat; 0.0mg cholesterol; 60.5mg sodium; 320.4mg potassium; 26.5g carbohydrates; 8.3g fiber; 6.2g sugar; 18.3g net carbs; 15.8g protein; 5.0 points. "She offered me a chair by the kitchen table and disappeared through the service door that led to the garden and came back with 6 lemons and a small bunch of mint leaves. As she squeezed them and stirred the juice with sugar and water in a pitcher, I found myself trying to recollect when I last had fresh lemonade. She carefully washed a few mint leaves and put them in the pitcher, and from a small bottle that was sitting on a shelf, she added two drops of a sweet transparent liquid. She then sat across from me and remained silent. Before she finally took a sip from her drink, she pointed to mine as a form of invitation, and I had a spurt of the essential quality of what the earth can offer. It was the two drops of essence of orange blossom that made all the difference." -- Christiane Dabdoub Nasser, "Leyla"
Squeeze the lemons and stir in the sugar. Add water and keep on stirring, making sure all the sugar has dissolved. Add mint leaves, essence and a few slices of lemon and refrigerate for an hour before serving in tall glasses with lots of ice. 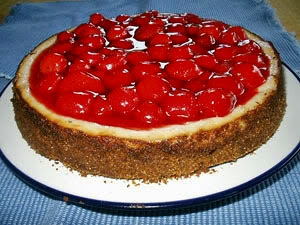 Tofu-Cashew Cheezecake with Strawberry Sauce from my book "Soyfoods Cooking for a Positive Menopause "
I doubled the recipe and made this in a springform pan, baking it for an hour. This is a traditional Palestinian dish, little known in Western circles. I've been wanting to try it for some time, and this week, busy with lots of different things, it seemed like an easy meal-- and it was! I've seen this recipe here and there on the 'Net, and I didn't change it, but I was little more exact with the measurements. It is simple and homey, not terribly attractive, but we really liked it. 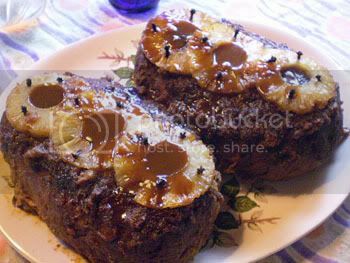 The browned, or caramelized, onions really make this dish, visually and taste-wise. 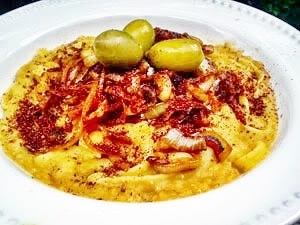 I've noticed that many Middle Eastern home-style dishes utilize browned onions as a topping. 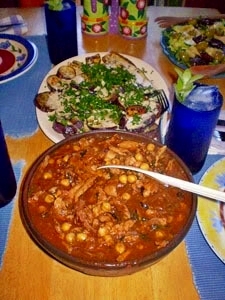 I think it was, and still is, an inexpensive and clever way to add flavor and color to otherwise very simple dishes. The recipes seem to indicate that this dish is served at room temperature, but we ate it hot. Do try this! Place the lentils and the tagliatelle in a deep pan (I used a stir-fry pan) with 3 cups of the water. Add the salt and cumin. When the water starts to boil start stirring, adding the last cup of water whenever the water level becomes minimal, until the mixture turns into a homogeneous thick broth-like mixture. This process should take about 15 minutes of stirring the mixture over medium heat off and on-- but keep an eye on it. Pour the lentil mixture into 3 flat pasta bowls. Top with the caramelized onions, then sprinkle with sumac. 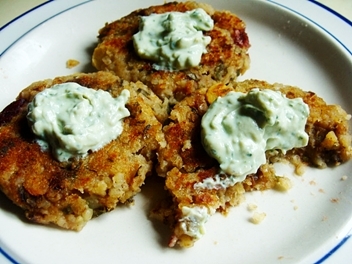 Serve with green olives, salad, or spring onions and radish. Nutrition (per serving): 421.1 calories; 13% calories from fat; 6.6g total fat; 0.0mg cholesterol; 643.6mg sodium; 553.8mg potassium; 71.3g carbohydrates; 8.9g fiber; 3.5g sugar; 62.4g net carbs; 21.1g protein; 8.2 points. UPDATE Aug 3, 2011: It just occurred to me (duh!) 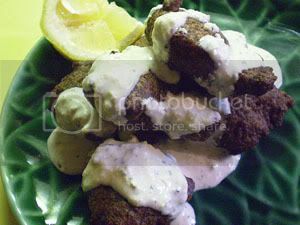 that these are a form of kibbeh (see here for info on kibbeh), so I've changed the name of the recipe. 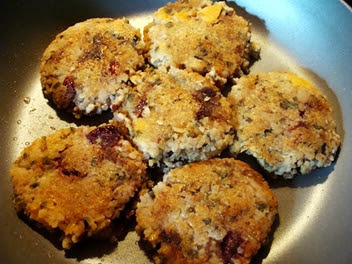 ALSO, I had some of the mixture leftover this week, and I tried making small patties out of it and browning them in a pan-- delish! See the recipe below for instructions and more pics. 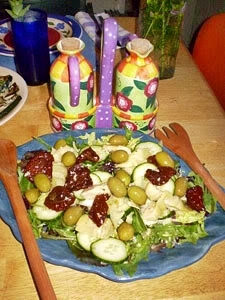 I adapted this (with what I had in the house) from a salad recipe in "Eating Well" magazine. I thought I had ruined it because I over-cooked the split lentils, so that they were mushy (to be fair-- this is very easy to do, since they cook so quickly!). The salad kind of stuck together like a pâté. So, I cooled it in the refrigerator and hoped for the best. It was more solid than a salad would be, so I decided to roll balls of it (loose balls) and nestle them in the beautiful butter lettuce that we had just purchased here on Denman from Piercy Farm. 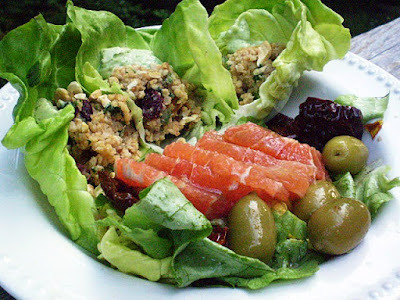 Served with a bit more lettuce topped with juicy sliced grapefruit and olives (with a couple of sundried tomatoes on the side) in a balsamic vinaigrette, it was a filling and easy dinner for a hot summer evening! It was also delicious-- DH loved it! 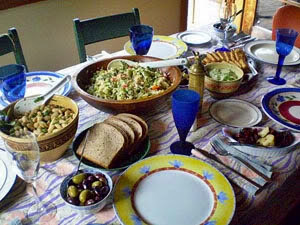 In the following picture, I served the kibbeh with a roasted potato salad with edamame and grape tomatoes. 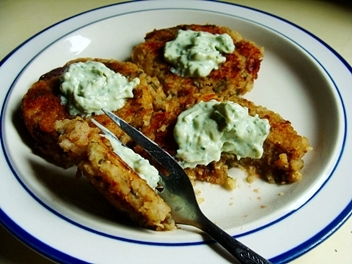 Basil Mayo: lowfat vegan mayonnaise blended with fresh basil and a bit of garlic to taste. Bring water, cinnamon and 1/4 teaspoon salt to a boil in a small saucepan; stir in bulgur, remove from the heat, cover the pan and set aside until the water has been absorbed, about 30 minutes. Transfer to a large bowl. Meanwhile, combine lentils and the remaining 1/4 teaspoon salt in a saucepan; add enough water to cover by 1 inch. Bring to a simmer and cook until the lentils are mushy, like dahl, and don't drain them. Add lentils, dried fruit, parsley, mint, lime juice and zest, and optional cashews and oil (if using) to the bulgur. Toss well and chill for several hours. When ready to serve, scoop out lumps of the mixture, roll them into balls and place them in crisp leaves of butter lettuce to serve, along with a dollop of Basil Mayo (lowfat vegan mayonnaise blended with fresh basil and a bit of garlic to taste). 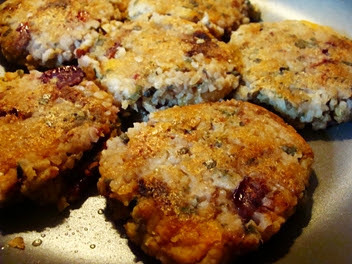 Form the chilled balls into small patties and fry over medium-high heat in a nonstick skillet or a well-seasoned cast iron, carbon steel or stainless steel skillet, sprayed with oil from a pump sprayer, until golden brown and crispy on both sides. I made a thin-crust pizza the other night-- always such a treat! Used some leftover homemade spaghetti sauce with a bit of crushed tomatoes added, sauteed mushrooms and red bell pepper strips, slices of Tofurkey's vegan Spicy Italian "sausage", freshly-ground black pepper,and sliced fresh basil. I placed the veggies and herbs OVER the grated vegan mozzarella because it melts better that way and gets nice and creamy. I drizzled the whole thing with a couple of Tbs. of peppery extra-virgin olive oil. I used 1 lb. 4 oz. of dough for the crust for a 16" pizza. I made the following white bread loaf (it does have some oat bran in it) just as an experiment to see how little yeast I could get away with (most bread machine recipes call for WAY too much yeast, which does NOT improve the flavor!). For this loaf, I used only 1/2 tsp. yeast in total. 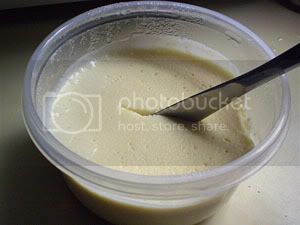 I made a sponge (loose batter) with all of the water, yeast and some of the flour and let it rise in the ABM container for 6 hours, before adding the remaining ingredients and baking it. Look how it rose! The crust was nice and crunchy. 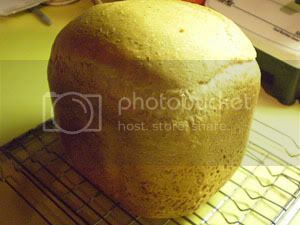 This can be used as basic bread for many variations. NOTE: This is the machine I have. Set on the Basic Cycle, Dark Crust. Check the dough during the first knead to make sure that it is neither too dry, not too wet. If it’s too dry, add water by the tablespoonful, letting it knead in, until it looks right. If it’s too wet, do the same with flour. If you want a more attractive top crust to the bread, 5 minutes before the bread is due to bake (I set my kitchen timer to remind me of this), you can make a decorative slash in the top of the bread with a razor blade, and you can also glaze the bread with some soymilk, using a pastry brush, or sprinkle the top with flour. Cover the “window” in the top of your machine with foil, so that the top of the bread will brown properly. Remove the bread immediately from the machine when done, placing on a rack to cool thoroughly. This will insure a crisp crust. Dinner the other night was Swiss chard from our garden (yum!) and tofu kebabs with peppers, mushrooms and onion. 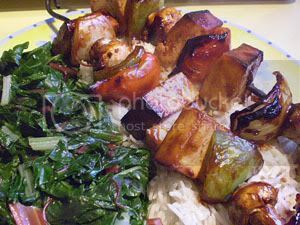 I had soaked the extra-firm tofu cubes in the Breast of Tofu (or Crispy Marinated Tofu from World Vegan Feast) marinade for several days, anticipating a meal such as this. I just threaded them on skewers with the veggies, slathered on barbecue sauce (my Bourbon BBQ Sauce ) and grilled them, serving them on a bed of Basmati rice. 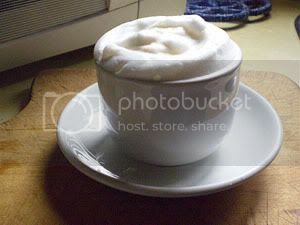 I just had to post yet another picture of a wonderful organic, fair-trade soy cappuccino made with my homemade soymilk! I always get such lame foam when I order soy cappuccinos in restaurants! I'm wondering if it's maybe because I use a cheap plunger-type milk foamer? I'm thinking that maybe foaming with steam dilutes the foam??? Last, but not least, two incarnations (above)of my experiments with Egyptian Felafel (ta’amiyya), which is made with fava or broad beans instead of chickpeas. 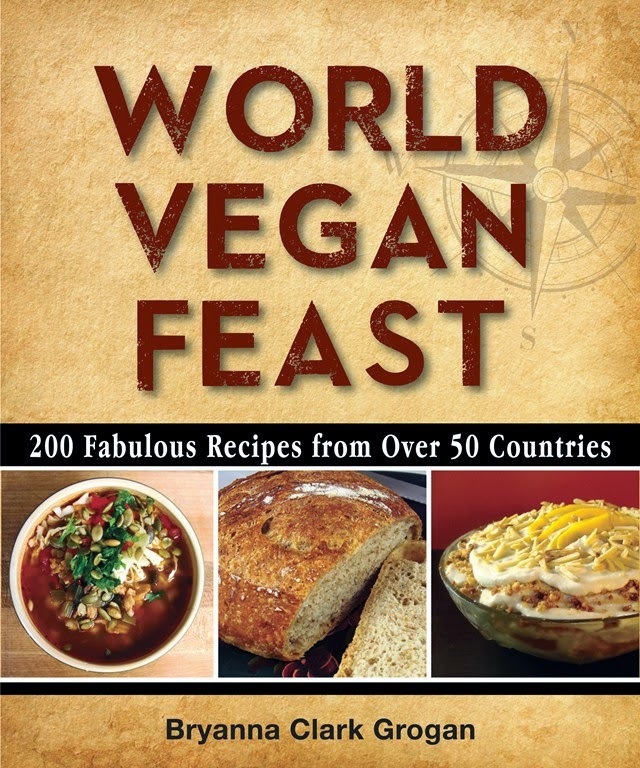 Spice Island Vegan raved about the recipe from Canadian author Habeeb Salloum's EXCELLENT books, "From the Lands of Figs and Olives" and "Classic Vegetarian Cooking from the Middle East & North Africa". I have a hard time getting dried favas, but I often use split yellow peas instead of dried favas in soups, etc., because, when they cook down to a puree they taste very similar. 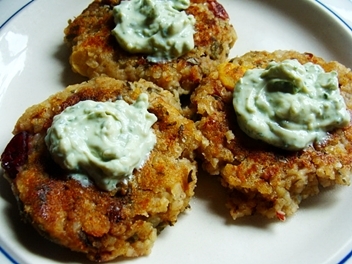 So, I substituted split yellow peas (cup for cup, and I did soak them) in the felafel recipe and it was great. However, next time I go to Vancouver I will get some fava beans and compare. 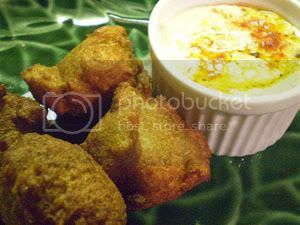 These felafel are very light, quite different than the chickpea ones. Actually, I could not shape the batter-- it was too runny-- so I just dropped little spoonfuls of it into the oil. 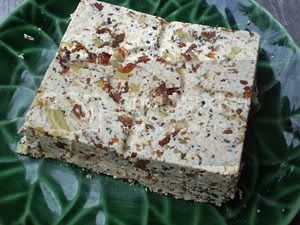 UPDATE ON MUSHROOM-LEEK GOURMET TOFU-- AND ANOTHER VERSION, TOO! I hope I won't bore you with my tofu adventures! Since I tried making the fresh sage, leek, and dried wild mushroom tofu two blog posts ago, I have talked to various other cooks about it, and wanted to try it with dried porcini mushrooms not soaked beforehand, so that the mushroom taste was more concentrated than in my first version (I soaked them the first time, then chopped them and added them to the soymilk). 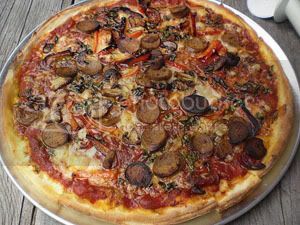 The originators of this recipe, on the wishwewerebaking blog, did not soak them first, but they used dried champignon mushrooms, which are not as strong as porcinis. Another friend used them without soaking, but did not specify the type she used-- she thought the results "screamed" mushroom on the first bite! So, I had to try it myself. 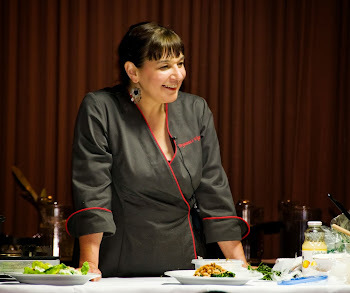 I also wanted to try adding the chopped leeks and sage raw, without sauteing, as I had done before. I figured that this would save time and effort, and that the leeks would cook in the hot soymilk, anyway. 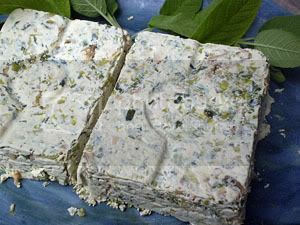 NOTE: There are explicit directions for making tofu, written by my friend Brenda Wiley, at this link. Just follow those directions, with my additions below. If you don't want to make your own soymilk, and you have access to fresh unflavored soymilk , you can use that instead. But make sure it is fresh and unflavored! I added these to the hot fresh soymilk in a large pot BEFORE adding the coagulant, let it come up to over 180 degrees F, and added the coagulant (2 tsp. nigari powder dissolved in 1 cup boiling water) slowly, covered the pot and let it sit 10 minutes. Then I stirred gently again and began ladling out the curds as instructed. BTW: I made this batch with 1 Tbs. (3 packets) nigari powder for coagulant, but I think I will use only 2 tsp. (2 packets) again next time. The extra nigari made the curds smaller, and I don't think that makes as nice a tofu. I thought the tofu was good, the mushroom flavor stronger in a subtle way, but I think I would saute the leeks and sage again next time. I think the leek and sage flavor came through better with the sauteed version, and the leeks did not "crunch". We just had some for a snack with real tamari (the liquid that drains off miso) from our local miso maker-- a treat! One thing I noticed was that the acid from the tomatoes (and any residual marinade on the artichokes, I guess) started curdling the soymilk before I even added the coagulator. But I added it anyway. I also noticed that the curds were smaller as a result. The tofu was a bit fragile from all the stuf I loaded into it, but tasted great! I might cut the tomatoes and artichokes down to 1/3 cup each next time. As I mentioned before, I did not store the tofu in water, as I don't want to destroy the flavor, and we ate it all up within a day or two. I just placed it in the fridge on a plate, covered with plastic wrap.